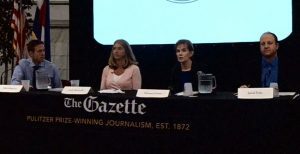 Four Colorado Democrats running for their party’s nomination in the June 26 primary declined to endorse the climate lawsuit brought against Exxon and Suncor by three Colorado communities in a debate Saturday hosted by Colorado Politics and the Colorado Springs Gazette. The lawsuit was filed April 17 in a joint announcement at the Boulder County Courthouse. When asked if the litigation was a “waste of taxpayer money, or a good idea” by the moderators, Polis pivoted to his support for local attempts to reach 100 percent renewable targets. “Lawsuits may occur, lawyers will debate them, they’ll get paid. Judges will decide. But at the end of the day I’m so excited by the groundswell of support at the local level,” Polis continued. When asked directly if he supported or opposed the lawsuit, Polis deflected. “Lawsuits aren’t a political matter. There have been lawsuits I’ve filed amicus briefs in the past, and I’m happy to talk about those, but I have not intervened in this lawsuit,” Polis responded. Lynne, currently serving with Gov. John Hickenlooper, answered by pointing to the need for strong leadership from a governor that will work collaboratively on issues. Lynne’s boss, Hickenlooper, allowed Colorado Department of Public Health and Environment’s Martha Rudolph, to speak on behalf of the current administration in early March. Rudolph encouraged “baby steps” and working collaboratively, echoing Lynne’s approach. “So what you’re trying to do is get people to see why they want to do something because it’s good for them, it’s good for something they care about. So I think that’s more valuable,” Rudolph told Western Wire. Kennedy offered the most direct response, ultimately opposing the litigation due to cost and time considerations. “I don’t know that litigation is the best strategy, but these communities are looking for leadership,” Kennedy said. She also touted her commitment to renewable energy, calling for an immediate doubling of the current renewable mandate. Kennedy concluded by acknowledging the cost and lengthy path of litigation might not be the best way to achieve climate goals. “As I said, I don’t think litigation is the best strategy. It’s costly, it’s going to take a long time. I want to see our state take steps now,” Kennedy said. In contrast to Kennedy, Johnston instead deferred, raising the concerns of communities in Colorado as an understandable reason for the litigation. “I have not read the lawsuit. What I think is real is the issue they’re raising is that there are massive costs to climate change that local communities are paying. And you only have to look out the window here to see that,” Johnston said. He offered the beetle kill in Colorado’s forests as a prime factor in many communities’ political and legal calculations, but did not clearly say whether the “reckoning” the state would have would—or should—include litigation. “There is no doubt their frustration is communities across the state are paying the outsized costs of climate change, and I think we’re going to have a reckoning to realize what that means. I do think that is why it does require an aggressive plan on renewable energy,” Johnston said. “However, before our community dives head-first into the rush to renewables as the primary source of power generation, we want to know that the reliability of the electrical service we currently enjoy will continue — and at a reasonable cost,” the editorial board wrote. “We don’t see the need to rush things for the sake of appearances,” they concluded. The Colorado Association of Commerce and Industry and the Manufacturers’ Accountability Project will jointly host a panel discussion this Thursday, led by former Interior Secretary and Colorado Attorney General Gale Norton, to discuss the Boulder climate lawsuit and other litigation against manufacturers.